If you have vision insurance, you probably have noticed that your plan covers "refraction." Refraction is a test that optometrists and ophthalmologists use to measure a person's refractive error. a refractive error is when your eye does not bend light coming into your eye properly as it passes through the cornea, the crystalline lens and fluid media to come to a sharp, clear focus onto your retina. The refraction test will tell the optometrist or ophthalmologist what lens prescription you need in order to have normal 20/20 vision. Most people that have had an eye examination remember the refraction as the part of the examination in which the doctor asks, "Which lens is clearer or better—lens one or lens two, or do they appear about the same? The ophthalmic technician or doctor will refract your vision using a phoropter, a device that contains hundreds of combination of lenses, to determine any possible refractive error such as nearsightedness, farsightedness, astigmatism, or presbyopia. Several methods may be used to measure refraction or the refractive error. These ways are sometimes used as an objective measurement or a subjective measurement or both depending on what the doctor is looking for. Each gives different information to the doctor so that a better plan may be made to correct the refractive error with eyeglasses, contact lenses, corneal refractive therapy or refractive surgery. 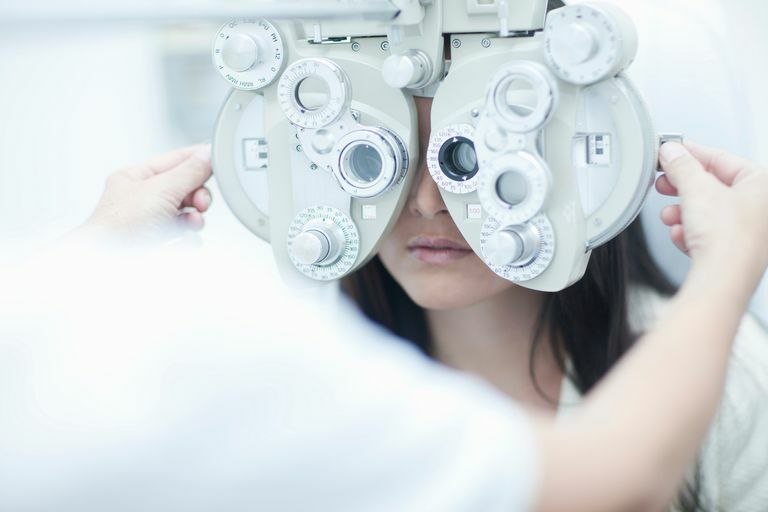 Retinoscopy - Retinoscopy is the primary method used by eye doctors and technicians to determine your refractive error and your prescription for corrective lenses. Retinoscopy is considered an "objective" method because the measurements are obtained without interaction or subjective information from the patient. The term retinoscopy literally means "an exam of the retina." By using retinoscopy, your eye doctor can determine the presence and degree of myopia, hyperopia, or emmetropia. Doctors use a retinoscope to perform retinoscopy. A retinoscope is handheld device and an invaluable tool for most eye doctors. Autorefraction - A refraction can also be measured using an autorefractor. An autorefractor is a tabletop instrument that uses light rays and a computer to measure how light refracts through your eye. Most eye doctors use autorefractor's routinely to develop a starting point that they may then compare to retinoscopy or traditional phoropter refraction. Wavefront refraction - Wavefront refraction uses an abberrometer to measure higher order refractive problems of the human optical system. An abberrometer produces a map that is referred to as the eye's "optical fingerprint" because it is unique and unlike any other person’s optical system. Unlike traditional vision measurements, which require subjective input from the patient, an aberrometer takes only seconds to obtain measurements and requires no patient input. Although it is a superior way to measure a person's refractive error, we have yet to find a good way of actually prescribing the result. Manufacturers have not found a way to put a wavefront refraction into eyeglasses and contact lenses yet. Manifest refraction - A manifest refraction is the most traditional way of measuring one's refractive error. As mentioned above, it is usually the part where the patient is shown choices and is involved in the process. It is called manifest because it the measure of the refraction before any eye drops are instilled or anything else that could alter the measurement. It is a measurement as the patient is in real life. A manifest refraction can be performed using a traditional manual phoropter or an automatic phoropter. An automatic phoropter is still controlled by the doctor but it is usually faster and all of the tests are run by a computer. Cycloplegic refraction - A cycloplegic refraction is a procedure used to determine a person's refractive error by temporarily paralyzing the muscles that aid in focusing the eye. Cycloplegic eye drops are used to temporarily paralyze or relax the ciliary body, or focusing muscle, of the eyes. Cycloplegic refraction is sometimes used when testing the vision children and younger adults that sometimes subconsciously accommodate or focus their eyes during an eye exam, making the results invalid. A cycloplegic refraction is also performed as part of a laser vision correction or LASIK consultation to determine the absolute refractive error before proceeding with laser eye surgery. National Eye Institute, National Institutes of Health. Facts About Refractive Errors, Oct 2010.